In Sweden the Disney Christmas show is as big a Christmas tradition as the Christmas tree and presents. Gosh, yes. If you don't watch Kalle Anka (Donald Duck) on Christmas Eve (From all of us to all of you) [except if you're not celebrating Christmas by some reason] you're almost seen as a freak. Sweden is CLOSED when it is on TV - NOTHING is open and if you're calling someone or knocking on someone's door during that time people are like "WHAT!?" It's almost holy. People are totally quiet when they watch it except when you're reading your favourite lines and discuss what's going to be the new clips this year. Disturb a swede watching Kalle Anka on Christmas Eve and no one will be happy. No matter age, the whole family - from the youngest children to the oldest great great grandparents - is gathered in front of the television and watching in awe - even though you already know every minute of the program except the new clips. It's great, and a time for family almost bigger than the opening of presents after the program. Oh, and when things got deleted people was so upset. And once when they (SVT - our governmental channels) was thinking about cancelling the program once the uproar from the people was one of the biggest Sweden has ever seen and they was forced to send it either way. We love our traditions. @Swedishbooks That is so true, we are really crazy about it! That should definitely be an avatar! Maybe they should open Disneyland Stockholm! @SpikeylovesSatW That would be "Disneyland nordic". 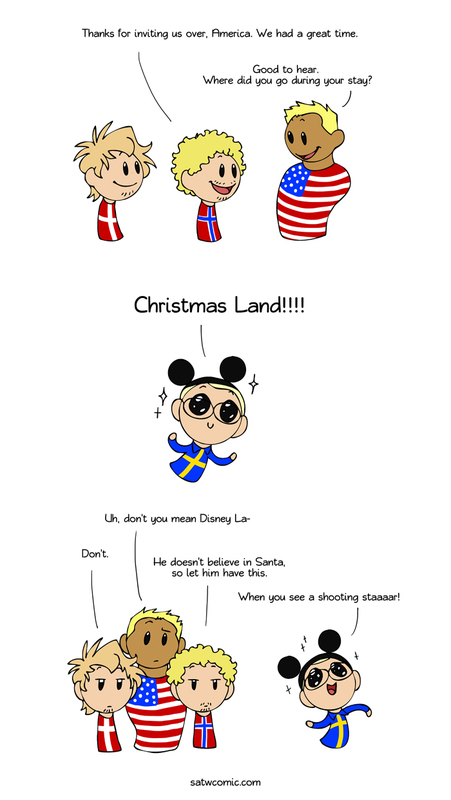 Send a picture of Sweden in the last panel to a Hetalian out of context and wait for their reply. @SwedishRainbow Hasn’t like... everybody in Sweden heard that version at least once like that ”tänd ett hus, och låt det brinna”? Or am I just one of a few? @potatoe4life mr goodman: breaking news. rudolph is returning to nbc.